Corporations took a shot at gutting America’s privacy laws, and they missed. 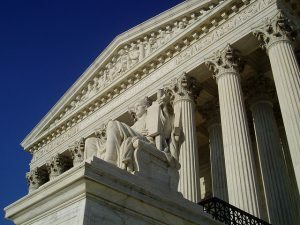 Every justice agreed – the decision is unanimous – that consumers can bring claims for statutory damages (where Congress says that if a corporation breaks some law, it must pay a fixed sum, even if the claims are hard to prove), even if the consumer has not lost money or suffered a personal injury. Corporate advocates had asked the Supreme Court to gut the nation’s privacy laws. They argued even consumers alleging that false statements had been made about them did not have a right to bring a case in federal court unless they could show an economic harm. The Court refused to take that step, and rejected the conclusion that corporate defenders sought in this case. Corporate defendants also wanted the Supreme Court to say that Congress couldn’t pass laws protecting consumers against illegal actions unless the corporation breaking the law had taken money from consumers. But the Court disagreed with Corporate America on that one too, and recognized that Congress can create “legally cognizable injuries” even if they were previously ‘inadequate in law” to be something that a consumer could sue over. So, for example, the Court recognized and applied an earlier Supreme Court decision noting that a consumer can bring a lawsuit for “failure to obtain information subject to disclosure” under a federal law. The only divide at the Court was whether or not the Ninth Circuit had adequately examined and detailed the nature of the harm or risk of harm in this case. A majority of the Court held that the Ninth Circuit had not gone through the proper analysis. The majority decision in Spokeo sets a narrow procedural rule, that courts have to engage in a two-step analysis before it recognizes a claim as one that can be brought in federal court. But this procedural holding is not a substantive loss for consumers – the decision doesn’t wipe away any actual claims. The Court explicitly held that it was not saying that the consumer’s privacy claims here could not go forward. The Court specifically said it “take[s] no position as to whether the Ninth Circuit’s ultimate conclusion – that Robins adequately alleged an injury in fact – was correct.” Instead, the Court held that the Ninth Circuit had skipped over part of the analysis that is required. The important pieces of legislation protecting consumers should also withstand the types of challenges that corporate defendants raised in this case. In determining whether violations of consumers’ privacy rights are serious enough to constitute a “risk of real harm,” the Court held that “Congress is well positioned to identify intangible harms that meet minimum Article III requirements….” And the Court noted that in some cases, plaintiffs need not allege any harm other than the ones that Congress has identified. As one important sign that injuries of consumers’ privacy rights will continue to be protected, Justice Thomas wrote in concurrence that the consumer’s claim that Spokeo had not followed “reasonable procedures to assure maximum possible accuracy of the information concerning” him “could arguably establish a private cause of action to vindicate the violation of a privately held right.” In other words, even Justice Thomas – who takes the most narrow view of standing of any member of the Supreme Court – has remarked that the core claim in this case (that the defendant had poor procedures regarding whether it reported inaccurate information about the consumer) should meet the Constitution’s requirements.